The TV MegaSite's Primetime News Chat: Showtime(R) Announces "Penny Dreadful: City of Angels"
[via press release from Showtime] SHOWTIME(R) ANNOUNCES "PENNY DREADFUL: CITY OF ANGELS"
LOS ANGELES - November 1, 2018 - SHOWTIME has announced the next chapter of the PENNY DREADFUL saga with PENNY DREADFUL: CITY OF ANGELS. John Logan, creator, writer and executive producer of the Emmy nominated series PENNY DREADFUL, will continue in those same roles. Joining him as an executive producer will be Michael Aguilar (KIDDING). Production is expected to begin in 2019. The announcement was made today by Gary Levine, President of Programming, Showtime Networks Inc.
"We were so thrilled when John Logan came to us with this wildly original take on the Penny Dreadful mythology that explores both the human spirit and the spirit world here in California," Levine said. "PENNY DREADFUL: CITY OF ANGELS promises to be an extraordinary saga of familial love set against the terrifying monsters that are around us and within us. "PENNY DREADFUL: CITY OF ANGELS will have a social consciousness and historical awareness that we chose not to explore in the PENNY DREADFUL London storylines," Logan said. "We will now be grappling with specific historical and real world political, religious, social and racial issues. In 1938, Los Angeles was facing some hard questions about its future and its soul. Our characters must do the same. There are no easy answers. There are only powerful questions and arresting moral challenges. As always in the world of PENNY DREADFUL, there are no heroes or villains in this world, only protagonists and antagonists; complicated and conflicted characters living on the fulcrum of moral choice." 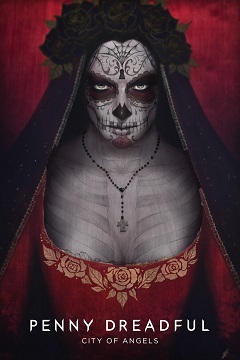 PENNY DREADFUL premiered in 2014 and had a jaw-dropping third-season finale in June 2016. The series has been honored with 13 Primetime Emmy(R) nominations, as well as a Golden Globe(R) nomination for lead actress Eva Green, and won three BAFTA(R) Awards. PENNY DREADFUL has developed an incredibly loyal fanbase, lovingly called "The Dreadfuls," that followed and rabidly commented on every twist and turn of the series.